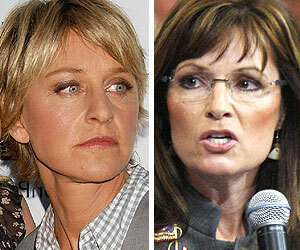 Comedienne Ellen DeGeneres took aim at VP hopeful Sarah Palin's views on the legality of gay marriage. "Vice presidential candidate, Governor Sarah Palin, says she favors a federal ban on gay marriage," Ellen said on her show today. "Basically, she wants to change The Constitution." The Emmy-winning talk show hostess continued, "I don't like it. I don't agree. Maybe it's because I'm gay that I think we should all be equal, but I feel that we're all equal. I don't know what people are scared of -- maybe they think that their children will be influenced. I was raised by two heterosexuals, I was surrounded by heterosexuals -- and they didn't influence me." 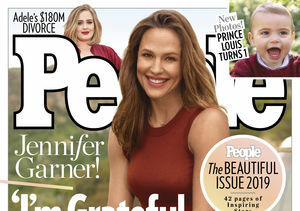 DeGeneres ended with, "People are going to be who they're going to be, and we need to love them for who they are. That's that." Ellen and longtime partner Portia de Rossi wed in an intimate Beverly Hills ceremony last August.